Editors Note: In anticipation of the upcoming episode Penguin Post Office, the UK Antarctic Heritage Trust has graciously allowed NATURE to republish recent blog posts from staff stationed at Port Lockroy in Antarctica, the home of the ‘Penguin Post Office’. 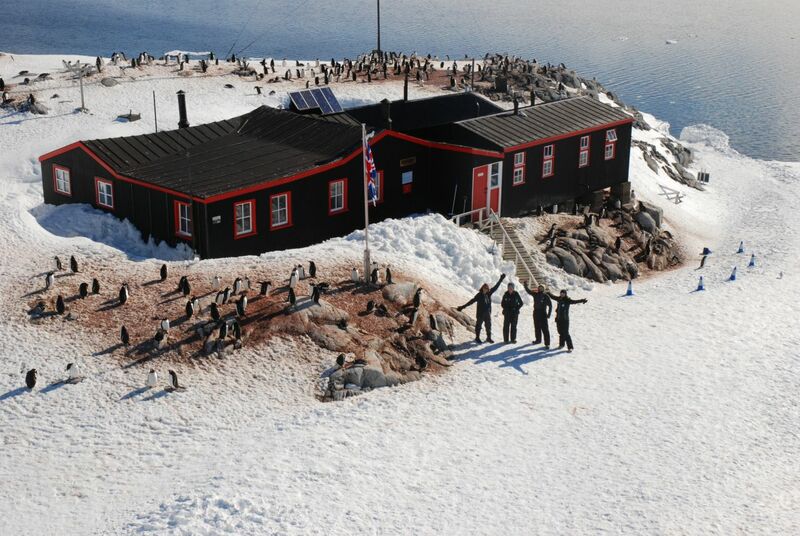 You can read more about the goings-on at the post office–and the penguins who live there–on the official Port Lockroy blog. 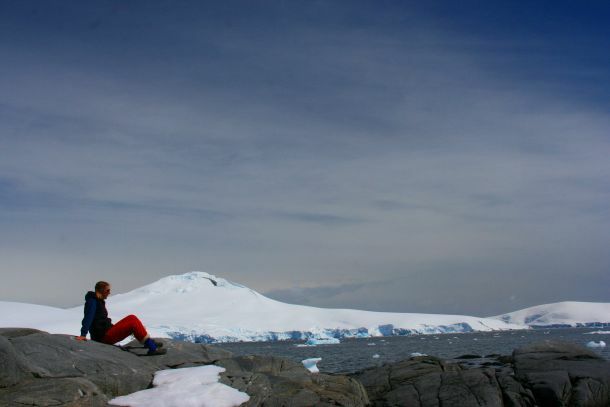 Rarely does one work in a place where it is impossible to have a bad day, but here on a small islet in Antarctica, I have just that scenario. Whilst here with a few co-workers managing the Post Office, museum, and shop for the UK Antarctic Heritage Trust (UKAHT), there are certain tasks and stresses that can tax a person, but stepping outside to visit the neighbors — over 1500 penguins — it is easy to smile, laugh, and enjoy the moment. There is a core team of four people working at Penguin Post Office. This year we have two British people, a French woman, and an American – all independent contractors for UKAHT. If special tasking is required, we have additional staff to address needs. For example, at present we have a skilled carpenter with us to do some specialized building maintenance and an expedition leader from a cruise ship working with us temporarily to learn more about our operations. All in all, not forgetting our resident sheathbills and skuas (sea birds), we have a nice little community. We are spending the southern-hemisphere summer here to help preserve Antarctic heritage through the conservation of six historic huts and the artefacts within. 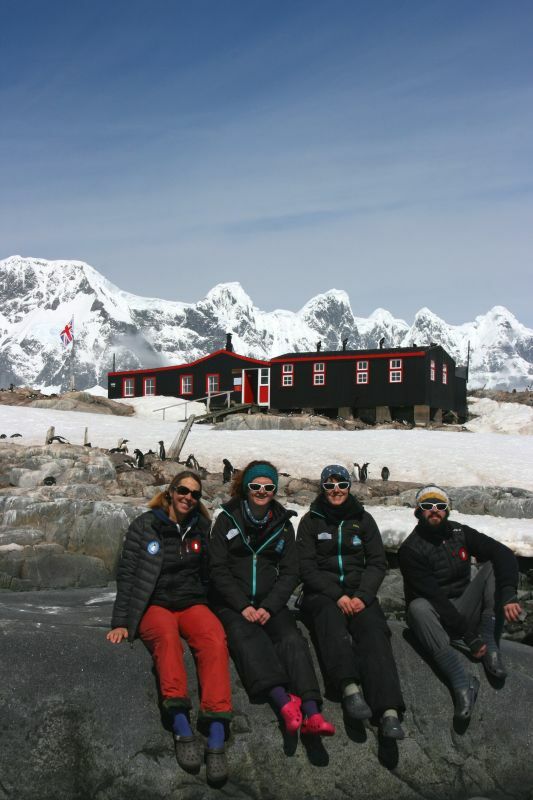 To provide funding for the project, we run a not-for-profit gift shop at Port Lockroy, have a “friends” program, and receive part of the proceeds from sales of British Antarctic Territory stamps at Penguin Post Office. While some people cannot fathom living and working on an island the size of a football field for four months, others will welcome the simplicity and tangible pleasures that are easily attained here. Most of our food is canned (but warm, filling, and very easy to cook), most of our entertainment is in the good company of those around us, and most of our work is achieved with satisfaction each day. Whether greeting guests or preparing for visits, sorting and canceling mail, or working on a long list of conservation and maintenance tasks, we have plenty to do and cannot even imagine boredom or “cabin fever”. People are often amazed that we do not have a boat for transportation or recreation in the protected bay or to nearby islands, but truly, when given the rare chance to live in a penguin colony for a short while, there is little reason to go anywhere. Nonetheless, we do “get off the rock” now and again, thanks to visiting IAATO vessels (International Association of Antarctic Tour Operators). We go on board ships for informational briefings, hot showers, sumptuous meals, and casual mingling with expedition staff and guests. The visiting ships also provide us with fresh water, since we do not have a water system on base and melting small chunks of icebergs takes a lot of fuel – they’re ever so nice, however, if we’re inclined to celebrate some occasion with any type of drink “on the rocks”. Clear glacier ice has a tendency to pop and crack when releasing ancient air bubbles, making any beverage more tasty and entertaining. We are surprisingly busy, often working 10-12 hours per day. Right now is our most hectic time of the season and we usually see at least one ship a day, and frequently more than that with so many motor vessels and sailing yachts exploring the scenic Antarctic Peninsula. Around the island, the penguins are also busy as chicks are hatching right and left. Our first chicks were seen on Solstice (21 December) and they are already almost half the size of their parents. The penguin parents are working constantly to feed their twins (most gentoos lay and hatch 2 eggs), and take turns on the nest and foraging at sea. While we work moving between buildings or gathering supplies, we often have to stop to give a penguin the right of way. They seem unbothered by our presence as long as we move slow and don’t block their path of travel. We also stop frequently just to watch them -thievery of rocks for nest building is a constant penguin pastime, and watching their greeting bows, gestures, and calls can stir one’s heart. It is difficult not to be anthropomorphic when watching them, because they really do remind you of little people strolling in the park or gently moving through the day. When night comes and we’ve canceled all the mail for the day, set up the gift shop for the next visitors, cleaned the museum, and put away our tools, we sometimes sit on some of the tumbled granite rocks on top of the island and enjoy the sound of our neighbors talking to each other or splashing about in the shallow pools by the old whaling chains, accompanied, perhaps, by the thunderous calving of the glacier in the back bay, the wind on the anemometer, the lap of the waves on the beach, and the crackling of bergy bits (small ice bergs). When we get too cold, we head inside our cozy “Nissen Hut” (similar to an American Quonset Hut), to settle in for the evening. It doesn’t get dark, nor does it get quiet here, but it is a welcome place to spend the austral summer. Even after I leave here in March, I will endeavor to remember this peaceful place and try to laugh and smile on the hard days. Next Post What Do Orangutans Eat?